Diamond is primarily composed of carbon and found in mines, like coal. But there is huge difference in value and importance of the two. Upper Karnali Project site on Karnali Bend is like a diamond that can be harnessed to develop as a multipurpose project with 4,180 MW installed capacity. But Government of Nepal (GoN) treated it like coal and gave it away to GMR, an Indian Company, to build peaking run of the river project (PRoR) with only 900 MW installed capacity, thereby depriving Nepal from benefits, inter alia related to stored water from reservoir and higher quantum of better quality electricity. Hence, the controversy. The project development agreement (PDA) for this project, signed (during coalition government led by Sushil Koirala) by Investment Board of Nepal (IBN) on behalf of GoN with GMR Upper Karnali Hydropower Ltd. (GMR) on 18th September 2014, requires GMR to arrange financial closure within 2 years. Failing to achieve financial closure within the timeframe, GMR requested extension by one year, which too expired without any achievement. GMR again requested another one-year extension, which was granted in November 2017. The failure of GMR to achieve financial closure throws light on: (a) GMR lacking financial capability to inject requisite equity to implement the project and (b) lack of trust on the part of international financial institutions in GMR. But GoN is unmindful of these and continues to extend the deadline to no avail. In this backdrop, it is high time to conduct a critical assessment of both options of this project, with an eye not only on benefits to Nepal but also cost to Nepal’s economy, including opportunity cost of not harnessing the site as reservoir project. • There is provision for free equity of 27% to Nepal. Hydrocrats seem to be belaboring under the mistaken impression that GMR will inject equity on behalf of Nepal and issue share certificates against it. This is a fallacy; it simply will be an accounting sleigh of hand. Actually GMR will issue share certificates to Nepal and simultaneously add equivalent amount in the books of account as “project development cost”, thereby increasing the project cost by commensurate amount. Specifically, as GMR has estimated this project to cost $ 1.4 billion (about Rs 140 billion) and if it is financed with 75% debt and 25% equity as stipulated in Section 11.27 of PDA, Nepal’s free equity of 27% will amount to Rs 9.45 billion. Meaning Rs 9.45 billion will be added to the cost of the project as project development cost to issue share certificates to Nepal. Further, free equity will have value only to the extent the project company succeeds to earn profit and declare/distribute dividend. GMR has already jacked up estimated cost. The project should have cost only about $ 600 million, especially due to the fact that project needs to dig only 2 km long tunnel, thereby shaving huge tunneling cost, which tends to be costly especially in Nepal’s geology. In this backdrop the project company is unlikely to earn or show profit. Besides, as this is an export-oriented project, GMR is in a position to use transfer-pricing mechanism to syphon off profit. GoN has not instituted any mechanism to pre-empt such activity. • Nepal is to receive 12% free energy from this project. GoN has taken it for granted that this will amount to 108 MW. This is only partly true. Because, GMR is now proposing to build the project as RoR scheme without peaking to avoid adverse impact on irrigation schemes downstream, in which case Nepal will receive only 18-36 MW as free power in dry season (almost 8 months a year). People are under illusion that free electricity received from this project will help mitigate Nepal’s load shedding. But the PDA has a provision to export free electricity in clause 10 (14A) and GoN has to pay “transmission tariff” to GMR for the purpose. Under clause 11.15.4 GMR has been reposed with the responsibility to take care of export for which it would be paid trading commission, too. This amounts to adding insult to injury: having to pay GMR to export free electricity that Nepal should have received and used, while Nepal languishes for lack of electricity. Incidentally, Nepal would stand to receive Rs 2.08 billion a year for 12% free energy (416 GWh) if sold at Rs 5/kWh; totaling Rs 52 billion, not Rs 81 billion as mentioned by IBN. Conversely, Nepal’s share of free energy will have to be sold at about Rs 8/kWh to achieve revenue stream of Rs 81 billion from free energy as claimed by IBN, but electricity from RoR scheme will not attract this high tariff. • IBN has mentioned that Nepal stands to earn Rs 116 billion in royalties from this project. Section 11.25 of PDA specifies that capacity royalty will be Rs 400 per kW and energy royalty will be 7.5% in first 15 years after commissioning, which will be increased to Rs 1,800 per kW and 12% respectively for 16-25 years. Therefore, annual capacity royalty will be Rs 316.8 million for first 15 years (on 900 MW minus 12%) and Rs 1.425 billion for remaining 10 years. Similarly, annual energy royalty on 88% of energy generated will be Rs 1.143 billion for first 15 years and Rs 1.83 billion for remaining period if electricity is exported at Rs 5/kWh. Total royalties Nepal will earn from this project over 25 years will amount to Rs 54.465 billion only, not Rs 116 billion; a clear case of overstatement. Even if GMR is to export electricity at Rs 10/kWh, Nepal’s royalties earning in 25 years will amount to Rs 89.922 billion only. However, as mentioned above it is highly unlikely that power from a RoR scheme would fetch Rs 10/kWh. Therefore, this too is a clear case of misinformation. • Similarly, IBN claims that Nepal will be paid dividend totaling Rs 137 billion in 25 years; annual average of Rs 5.48 billion. As mentioned above, Nepal will own shares in the project of Rs 9.45 billion and in order for Nepal to earn dividend from this project of Rs 137 billion in 25 years, dividend pay out rate will have to be 58% of equity each year. It is over ambitious to expect dividend pay out at this rate. Besides, as mentioned above, this project is over capitalized at Rs 140 billion and its chances of earning even decent profit is rather slim; forget dividend declaration at almost 60% each year. Realistically, Nepal may earn Rs 945 million each year (10% of equity), totaling Rs 23.625 billion in 25 years at the most; not mouthwatering Rs 137 billion. • Moreover, IBN claims that Nepal’s treasury will receive Rs 84 billion as income tax over 25 year period. While discussing what Nepal is to receive as income tax from this project, provision of Section 3.2.4 of PDA should not be lost sight of, under which GMR is completely exempt from income tax in first 10 years and the exemption is 50% in years 11 through 15. Therefore, no income tax will be received in first 10 years and receive Rs 700 million a year as income tax from years 11 through 15 (at the rate of 50% of 20% under Clause (4) of section 2 of Schedule 1 of Income Tax Act), totaling Rs 3.5 billion in 5 years, supposing GMR succeeds to earn net profit of 20% on equity. In the same vein, income tax receipt will total Rs 70 billion (Rs 7 billion/year) in 10 years spanning years 16 to 25. IBN estimate of income tax revenue of Rs 84 billion, for a change, is close to real potential income tax revenue of Rs 73.5 billion. • In “estimated financial benefit within 25 years of concession period” IBN also has included Rs 9 billion and Rs 1.3 billion as VAT and custom duty, respectively, totaling Rs 10.3 billion. It needs to be remembered that the VAT and custom duty facility to GMR costs the treasury Rs 14 billion and Rs 5 billion respectively as described below. Moreover, GMR is to be paid subsidy of Rs 5 million per MW for having paid VAT to GoN, totaling Rs 4.5 billion. IBN mentions that Nepal will receive Rs 10.3 billion as VAT and custom duty, but fails to mention loss to GoN treasury of Rs 23.5 billion, including as subsidy. • IBN has estimated that there will be 3,000 direct jobs during peak construction period. What IBN has failed to mention is the fact that direct employment in the project will be less than 100 after commissioning of the scheme due to automation, remote control, etc. Another fact of vital importance that IBN has ignored is that with no work permit required, people from across the border will be employed in these jobs, rather than from Nepal. There is no mechanism to ensure that only people from Nepal benefit from such employment opportunities. • IBN has painted a rosy picture by mentioning that it will “boost local industries”, forgetting that industries need to be powered by electricity. With every kWh of electricity (including free energy to Nepal) generated by this project being exported, it will not be possible to set up industries locally for lack of energy. Therefore, contrasted with IBN’s expectation, fostering entrepreneurship becomes merely pipedream when it is not possible to establish industries for lack of energy. • Construction of roads bridges, schools, health and community centers, etc. by the project finds mention in the list of benefits prepared by IBN. An important question that goes abegging is: do not people affected by this project deserve roads, bridges, schools, health and community centers, etc. even without the project being implemented? Why should they be made to await implementation of this project for these basic infrastructures, which citizenry from other parts of the country take for granted as innate right? 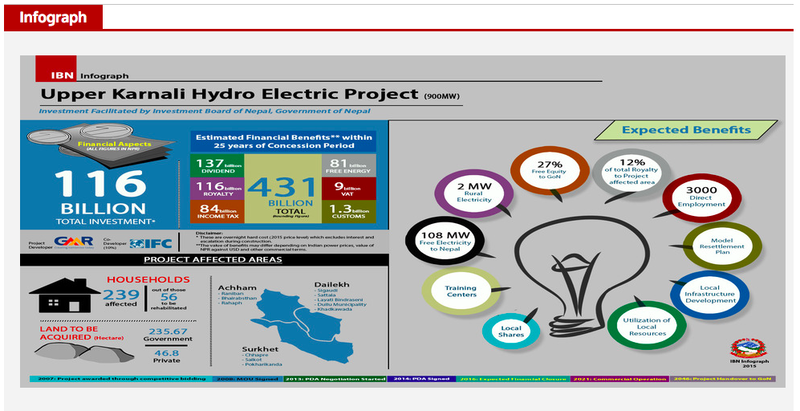 In this manner, IBN claims that Nepal will receive financial benefit totaling Rs 431 billion over 25 years. But realistically speaking Nepal is likely to receive only about Rs 214 billion in the period. Maybe it is a case of over-enthusiasm on the part of IBN or accepting illusory numbers fed by GMR with “creative” financial/economic analysis. Another important aspect to be remembered is the fact that these are nominal amounts that Nepal hypothetically stands to receive over 25-year period. An objective evaluation of such amounts requires computing present value of such amounts, which IBN has failed to do or deliberately forgot. • Under Section 9.2.1 of PDA, GMR is entitled to Rs 5 million per MW as subsidy, amounting to Rs 4.5 billion for having paid VAT to GoN, although under Nepal law only the projects that connect to national grid to meet Nepal’s internal demand are entitled to it. Such subsidy will reduce initial investment of the project and effectively reduce cost of generating power. This is equivalent to subsidizing buyers of electricity abroad. It is strange that Nepal, a poorer neighbour and supposedly receiving largesse from India, is enabling the project to export electricity at cheaper rate. • Similarly under Section 9.2.2 of PDA GMR is entitled to 50% custom duty exemption on cement, iron and steel products. This facility is not afforded to projects built to meet Nepal’s internal demand. Such exemption is estimated to cost Rs 5 billion to Nepal’s treasury. • Further, under Section 12(7) of Electricity Act, GMR is exempt from paying custom duty (except for 1%) and VAT on import of plant, equipment and machinery; estimated cost to Nepal’s treasury Rs 14 billion (assuming cost of electro-mechanical equipment to be 40% of initial investment). • Moreover, under section 3.2.4 of PDA GMR is exempt from income tax in first 10 years and 50% from year 11 through 15. Nepal loses Rs 14 billion on Income tax exemption in first 10 years and Rs 3.5 billion in years 11 through 15. Total loss to economy Rs 17.5 billion. In total Nepal loses Rs 41 billion in various facilities to GMR. But this facet has been completely ignored by IBN; highlighting what Nepal stands to receive (even overstating it) but ignoring what Nepal is set lose. Section 12A.6 of PDA makes Nepal further vulnerable, as it stipulates that GoN shall be liable to any loss GMR is to suffer due to changes in law. GMR, after establishing a company in Nepal under Nepal law called GMR Upper Karnali Hydropower Ltd., to implement the project becomes a corporate citizen. But in contrast with other corporate citizens that are subject to Nepal’s prevailing law, GMR is immune. Quite a lot of discourse has taken place about suitability of this particular site for reservoir project (4,180 MW) instead of RoR (900), peaking or otherwise. In this backdrop an analysis of opportunity cost of building RoR scheme instead of multipurpose project is called for. This very site if developed as reservoir project would have generated annual energy of 10,985 GWh compared to just 3,446 GWh from RoR scheme. Importantly energy from reservoir project would be of high quality fetching higher tariff. Besides, reservoir project results not only in downstream benefit but also can control flood to an extent, which are not possible from RoR projects, peaking or otherwise. Moreover, reservoir project can also facilitate inland navigation in downstream areas as well as in the lake formed by the dam. • Free power will be 502 MW; same in both wet and dry season, contrasted with 108 MW in wet season and 18-36 MW rest of the year. Similarly, free energy will be 1,318 GWh from former compared to just 415 GWh from latter. Besides, not only the quantum of free energy will be higher by more than 3 times, but the value too will be higher by more by Rs 10 billion (Rs 13 billion from former compared to just Rs 2 billion from latter). • Nepal’s revenue from royalties from multipurpose scheme will be Rs 391.5 billion in 25 years (capacity royalty Rs 500/kW and energy royalty 10% in first 15 years and Rs 2,000/kw and 15% respectively in 16 though 25 years) compared to Rs 54.465 billion from latter. • In the same vein Nepal’s treasury will receive exponentially higher amount by way of dividend, income tax, VAT, other taxes, etc. due to reasons like more than 3 times energy that fetches higher tariff and large scale economy. • Compared to building RoR scheme of 900 MW, building 4,180 MW reservoir project will generate employment by a magnitude higher. • Generation of more electricity means more energy to boost local industries to higher plane. Nepal will be deprived of potential benefits listed above, if the site is developed as RoR scheme, an opportunity cost to Nepal. Generally reservoir projects have multipurpose benefits, all over world due to production of additional water in dry season in controlled manner. Besides, reservoir project also results in flood control in lower riparian areas. These are important benefits that Nepal stands to lose if GMR is allowed to implement it as RoR Scheme. People believe that Nepal is rich in water, which is just mirage as Nepal suffers from flood in wet season and drought in dry season; in an average Nepal is rich in water but Nepal suffers from water poverty. In dry season (spanning almost 8 months) people in rural areas not only become sick for lack of potable water but even succumb to it. But a reservoir project will avail additional water not only by way of lean season augmented flow, but also by recharging underground aquifers. This results in water security. Nepal’s province number 6 and 7 will be deprived from water security if RoR scheme is built on this site instead of storage project. Water security has very higher value and monetization of such benefit may not an easy task. Water for drinking (people cannot live long without drinking water) and sanitation (linked to hygiene and wholesome health) is second most important necessity for human beings, just after air to breathe. Similarly, there is rampant starvation and famine in Nepal in general and more so in province number 6 and 7 in particular for failure to achieve food security. Building reservoir project on this site will avail water for irrigation in dry season, enabling intensive cropping (up to 4 crops/year compared to one crop in most agricultural land now). This site can generate 500 cubic meters per second of lean season augmented flow, enough to irrigate 1.5 million hectare of land. Remembering that land cannot be irrigated with petrol/diesel, the real value of irrigation to achieve food security is manifold compared to benefit from electrification (people can survive without electricity, but not without food for long). Therefore, no attempt is required to impute value of food security, besides stressing that people need to be fed to be able to enjoy electricity. It should not be forgotten that there is no alternative to water, mainly fresh water, whereas energy can be generated from a number of sources, both clean/renewable and unclean/unrenewable. With more energy generated from this site, it will help Nepal achieve energy security too if Nepal is to refrain from colonial model of development in which Nepal’s primary resource (electricity being one example) is exported. Essentially, GoN has glorified potential benefits disproportionately (also in nominal value), while sweeping costs that Nepal’s economy has to bear under the carpet. Also GoN has completely ignored benefits from multidimensional uses of stored water that will ensure water, food and energy security from multipurpose project. Therefore, GoN has blundered by allowing GMR to build RoR scheme on this site, due to which Nepal will be deprived from close to Rs 1,000 billion in direct financial benefits too. From this perspective it is an antinational act. For some nationalism is just abstract. But this project is economically and financially detrimental to Nepal’s national interest, not just in abstract sense. GoN’s this action results in huge economic and financial loss to the nation. 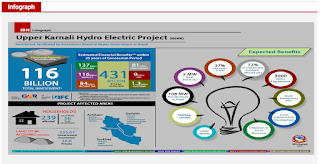 GoN decision to earmark the project as export oriented has ignored positive impact on the economy if electricity is used in Nepal due to multiplier effect and, hence, this decision is detrimental to Nepal. In view of this new government that will be formed imminently needs to correct this blunder and implement multipurpose project on this site in Karnali Bend for consumption of both water and electricity in Nepal.